This Sunday – A Reading of LEX JULIA – 2pm at the Lounge! 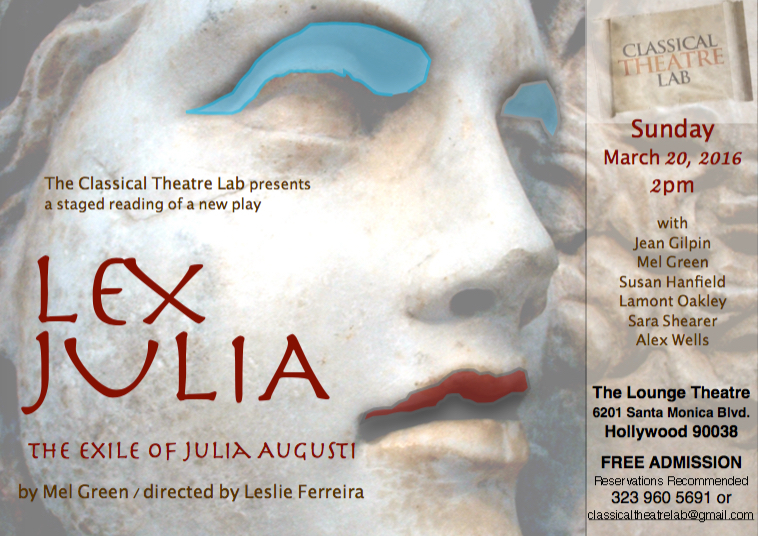 I’m excited to be back at the Lounge Theatre this coming Sunday, where I will be playing fiery Julia Augusti, in a staged reading of LEX JULIA. This riveting new play is written by Mel Green and directed by Leslie Ferreira. LEX JULIA takes place in a time when Rome was in transition from Republic to Empire. A time when Julia, an educated, politically savvy party girl, was the only person her father, the first Emperor, couldn’t control. A time, when control always reigned supreme and a daughter who didn’t abide by Daddy’s rules…might just have to disappear. This is the exile of Julia Augusti. Please join us at 2pm on Sunday, March 20th at the Lounge Theatre. This entry was posted in Actor, News, Press and tagged Lex Julia; Julia Augusti; Theatre; Stage; Lounge Theatre; Susan Hanfield;. Bookmark the permalink. ← A Reading of INO and The Judgement of Paris – Today at 2pm!